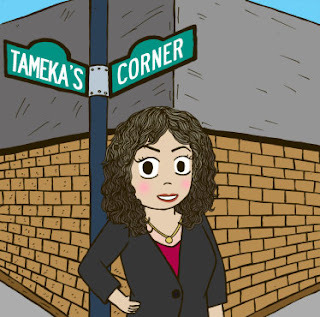 Tameka's Corner: So....it's been a minute! Yea, it's been a while since I've written a blog post. I must admit, facebook has been getting all my social network love and attention for the last few months. So a lot has happened since the last time we talked. Shortly before I started this blog, I'd called off my wedding and thought this would be a good outlet and release. However, as it turned out all I wanted to do was mourn in private and didn't feel like blogging one bit. Well, fast forward six months and you get a fresh chick with a new outlook on life. God is good. He takes good care of me and comforts me in my time of need. LIFE IS GREAT! I've moved forward with career goals, went back to school, moved into a fabulous apartment, travel at least once a month, started back up my business and continued to stay active in church. Although I am no longer a bride-to-be, I fell in love with wedding "stuff" during my planning stage and every once in a while, I will post some things here that I run across that I'd like to share. I'll also post some new sewing creations I come up with, new recipes I want to try (and succeed), travel excursions and good times with friends and family. WELCOME BACK TO MY WORLD!!!!!!!!!!!!!!! Hey! Just stopping by to say that I miss you & I am STILL planning my wedding, lol. But yes, God is good & He is SOOOO faithful. I hope all is beautiful in your world & I pray that you'll grace my blog with your presence from time to time. I sure need it!